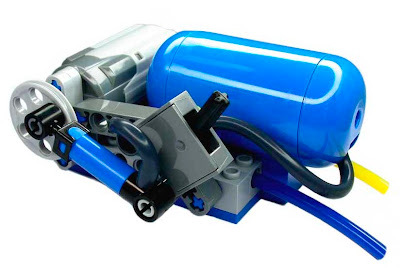 My friend Mauricio, who runs iLegos just came with another cool design proposal for a LEGO TECHNIC compressor. This one, includes a new PF Motor ('M' size)*, a Mini-Pump, a Switch, an Air Tank of-course and some colored Pneumatic Hoses to easy air flow identification. You can find it here and just though interesting to highlight it today at TBs, as I loved its simple and cute design. Integrated Pneumatic Switch allows Cylinders to move both ways. *) This allows to easily remote control the compressor, by using a Power Functions Remote and an IR Receiver. Paul (sariel), that one is great too! This, despite I've thought to highlight your design, more on the Electric Valve control perspective, which I found marvelous! Maybe I'll add other valve control designs (also on queue) in the same post, or left them to other posts!? That's a really interesting way to avoid the need for an automatic compressor! Just turn the motor in the direction you want the cylinder to move, and stop it when it reaches the limit of motion. I imagined another design, which still needs a separate compressor (but, in doing so, can use a single compressor for the entire model), but can semi-independently control two valves ("semi" because they can't be actuated simultaneously). It's a funny coincidence that it also uses a sliding worm assembly, like your design! Theoretically it works by moving one valve (which one depends on the direction of the motor, hence the sliding worm) from one position to the middle, then to the other position, then back again, and stopping the motor when the valve is at the desired position. I wrote "theoretically" because I didn't have time to physically build this contraption, so I don't know, for example, if the 8T gears provide enough torque to shift the valves.